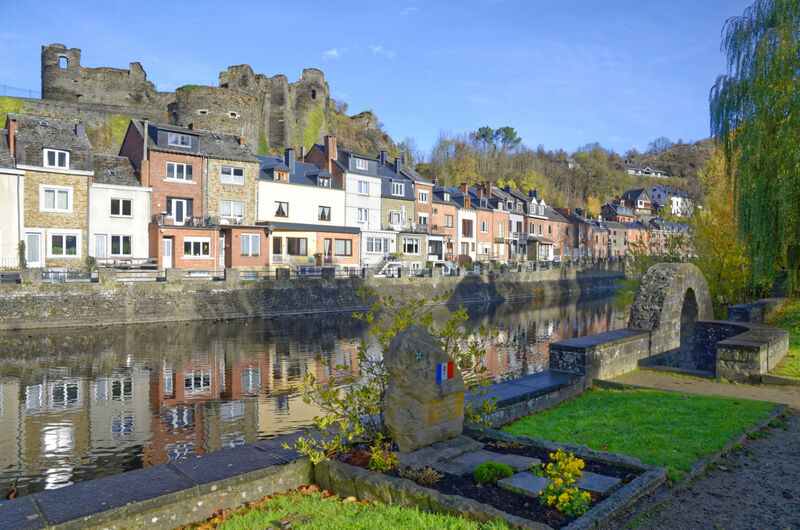 La Roche "Pearl of the Ardenne"
Nestled in a meander of the river and dominated by the ruins of the medieval castle, La Roche is today an important holiday resort of the Ourthe valley. 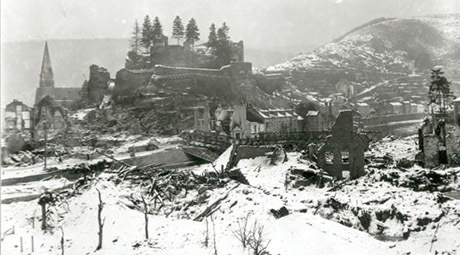 Yet, in December 1944, during the Battle of the Bulge, La Roche was 90% destroyed and 114 inhabitants were killed. 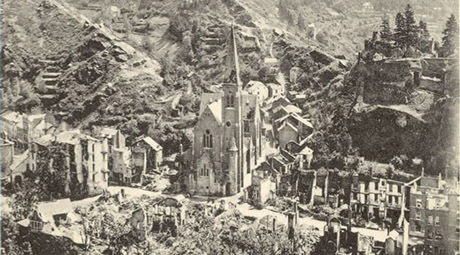 This tragedy earned La Roche the official recognition as "martyr town" and the Warcross 1940 with Palm, that one can see today on its coat of arms. The coat of arms of the town figure on the pediment of the town house. They date back to 1407. 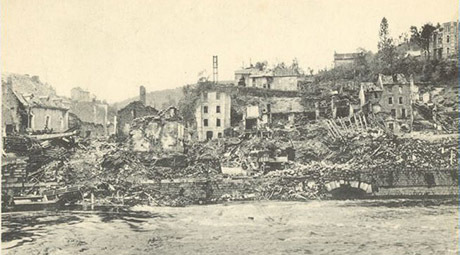 "The fine conduct of its population that distinguished itself during the present war by exceptional courage during the bombings and fights of the liberation endured by their town including the same dangers as those on the battlefield"
1. 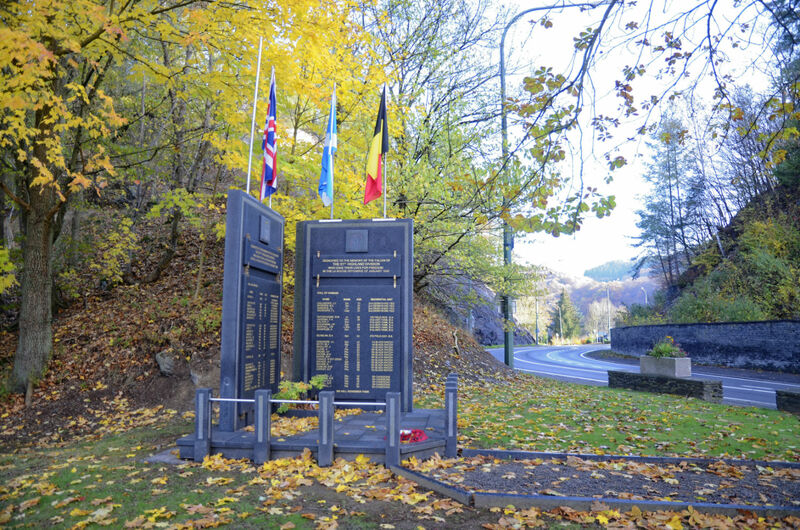 Monument dedicated to the 51st Highland Division "Roll of Honour"
It's in May 1999 that this monument was inaugurated, in the presence of veterans of this division. On the monument figure the names of those of this unit who died during the battle. 54 names can be seen. 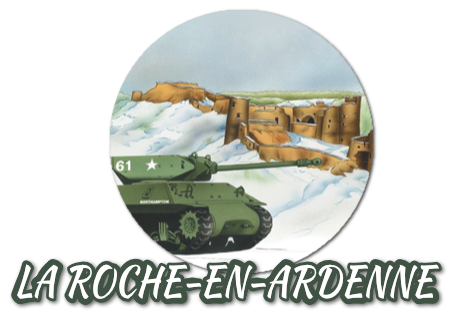 Above these names figure the badge of the division and the coat of arms of La Roche-en-Ardenne. It's an SP 17 tank destroyer, British version of the US M 10 tank destroyer. This version has a 17lb. canon. Inaugurated on 11 January 2000 in the presence of British veterans, it pays tribute to the 1st Northamptonshire Yeomanry. 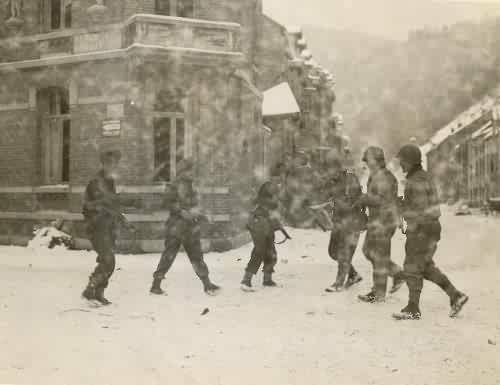 This division was in support of the Black Watch when they entered the town in January 1945. On the front of the tank a commemorative plaque tells the story. 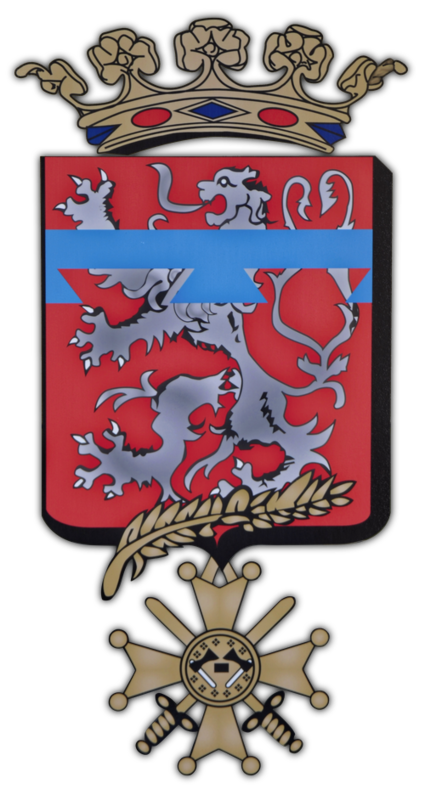 The insignia of both divisions figure on each side of the plaque. It's an M4A1 model, the second series of Sherman tanks built. To reduce the vulnerability of the first series, a model was produced without sharp angles. This rounded shape was to make the enemy shells ricochet. We can see however that a number of hits destroyed this tank. The turret is not the original one. It's fitted with a 76mm long canon instead of the usual 75mm. 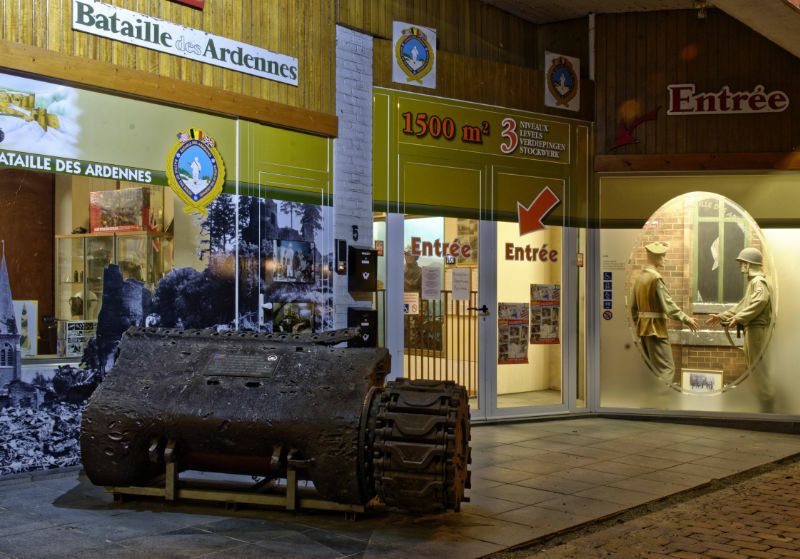 The tank was restored by the men of the 1/3 Lanciers of Marche-en-Famenne and inaugurated on December 17th, 2004 during the 60th Anniversary of the Battle of the Ardennes. It has replaced on this spot a Pershing M46 tank that stood here since 1990. This plaque was named "Plaque of the junction". It commemorates the meeting between American ant British troops in January 1945. 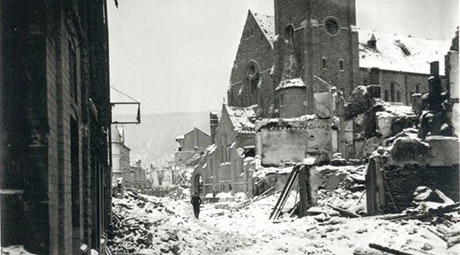 The US troops were part of the 84th Infantry Division, the "Railsplitters" and were coming along the right bank of the river Ourthe. 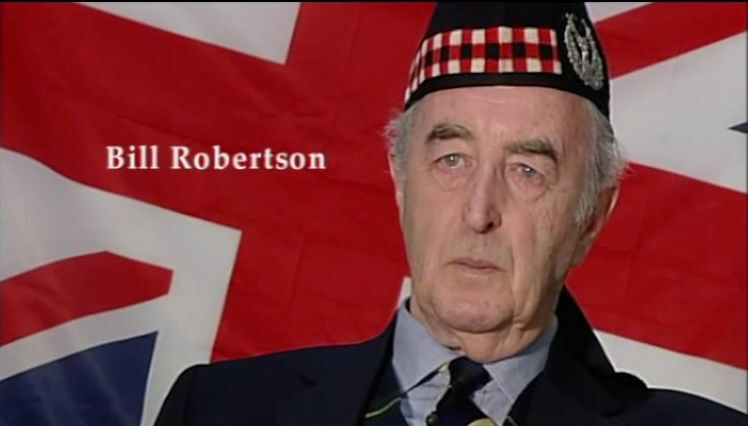 The British were from the 51st Highland Division and more particularly from the "Black Watch", and they were in charge of the other bank. The logos of both divisions are reproduced on the commemorative plaque. It's a period photography that served as the inspiration for the creation of this monument. 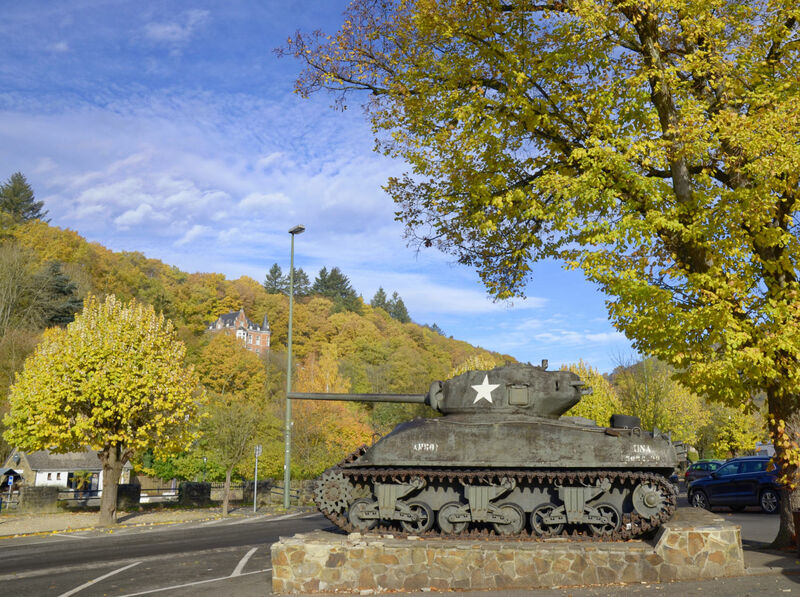 This monument is dedicated to the soldiers of the US 84th Infantry Division who liberated the town of La Roche and the surroundings villages in January 1945, during the Battle of the Ardennes also known as the Battle of the Bulge. 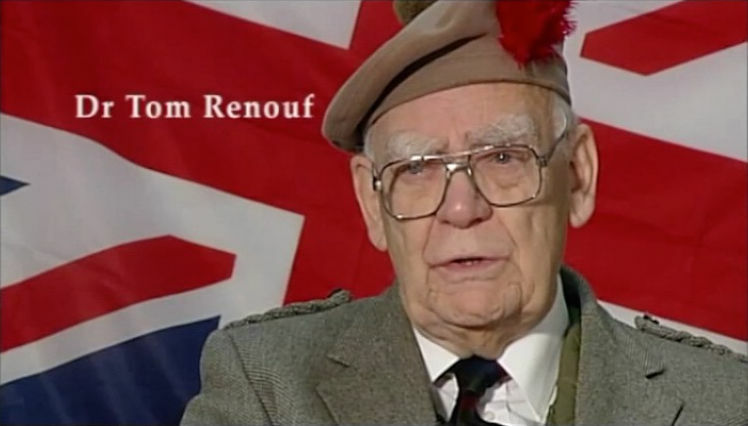 A commemorative plaque was unveiled on September 12th, 2009 in the presence of the veterans. Recuperated from the battlefield this front part of a Sherman shows the violence of the explosion that destroyed it. This monument made by the Heck company, symbolises the first liberation of the town, in September 1944. It was inaugurated on 18 September 2004 within the framework of the festivities linked to the 60th Anniversary of this event. 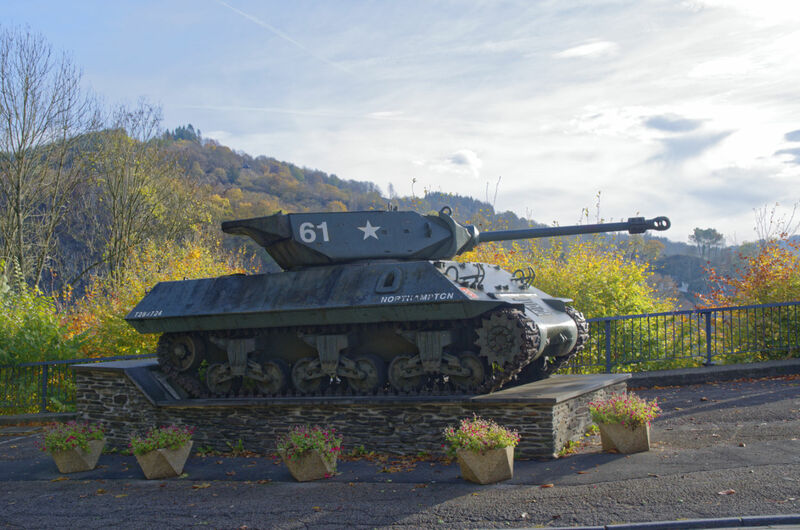 This monument is a tribute to the sole allied victim to fall in La Roche during September liberation. 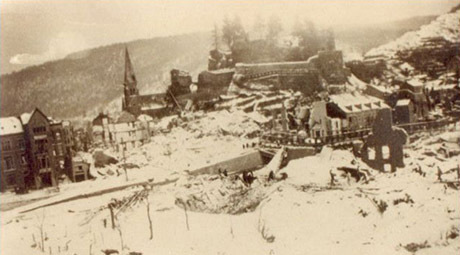 Michel Prioux, a young Frenchman, fell at this very spot, around 7PM, hit by a sniper hidden in the castle. The Croix de Lorraine can be seen on the monument, reminding us all the fight of Michel Prioux in the ranks of the "France Libre". The badge of the 4th US Infantry Division also figures on the monument. 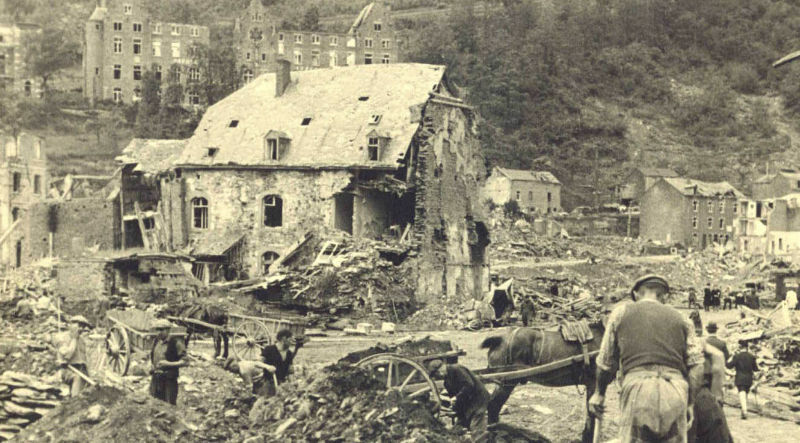 Elements of this division who had previously liberated Paris entered in La Roche-en-Ardenne in September 1944. This monument, dedicated to the dead, the deported an the soldiers of World War I, dates back to the early twenties. 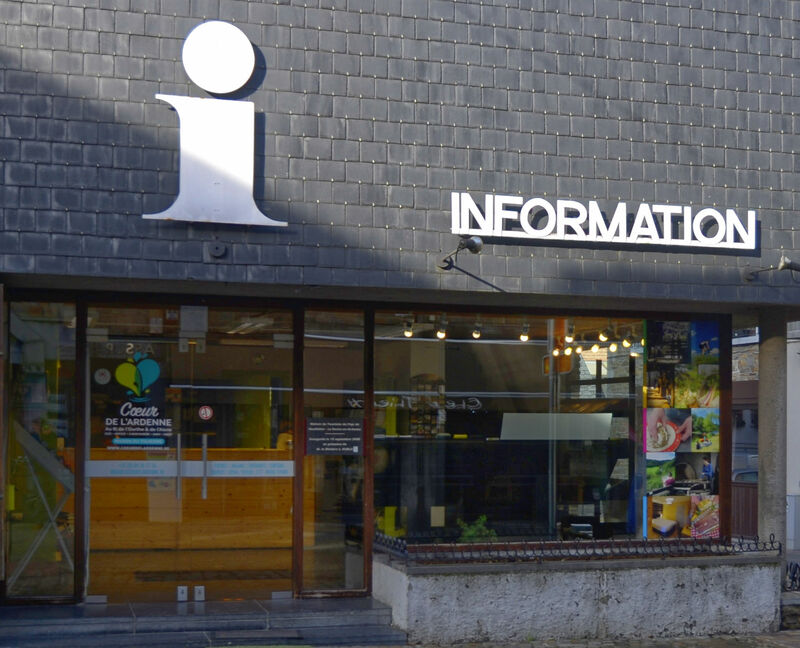 It was built by public subscription. Originally, a small barrier, slightly larger than the actual one, surrounded it. Furthermore, the cartouches were covered in bright metal. On the top, stands a Victory armed with a sword pointing down. This Victory holds au laurel leaf pointed at the sky. 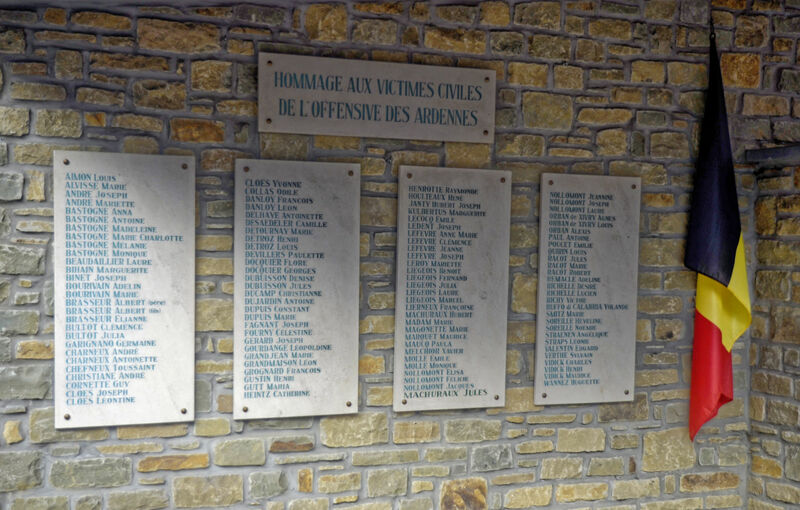 A Typology representative of monuments dedicated to heroes of the first world war. Heroes of whom the names figure on the central panel. Unfortunately, the monument needed to be "completed" after 1945. These names are on the two sides panels. 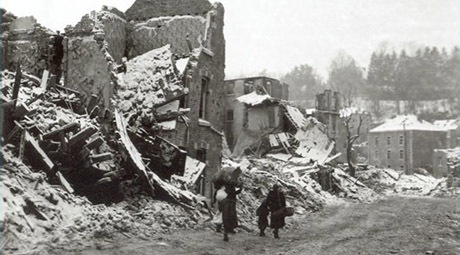 A tribute is also rendered to the civilian victims of the Ardennes offensive and to Michel Prioux. This plaque was added in 1984. 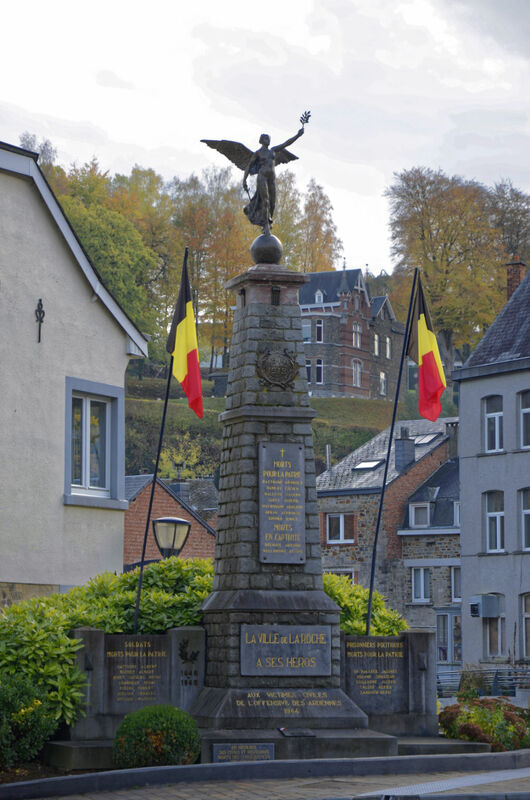 The monument to the dead of La Roche-en-Ardenne suffered no damage during the Battle of the Ardennes. All patriotic ceremonies organized in the town will stop here. It was restored in August 2004. The home was destroyed during the Von Rundstedt offensive in 1944 and rebuilt in 1962 following the plans of the architect Hosdain. 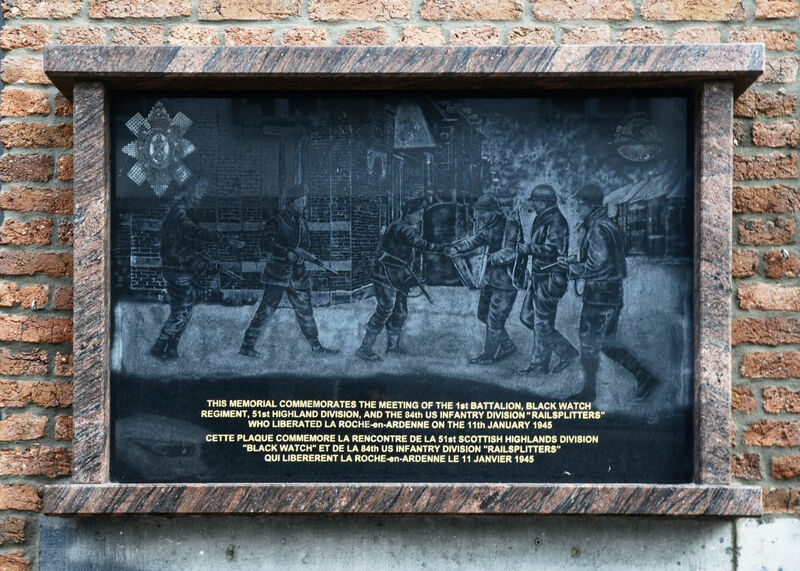 A commemorative plaque reminds us of these events. At the entrance to the chapel, i.e the door on the extreme right is a monument in honour of the civilian victims of the bombardments. Note, in the right hand column, the name of Yolande Ruffo di Calabria. The lady, born in La Roche and buried in the town cemetery, is parent of our queen Paola. Yolande was the daughter of Agnès Orban de Xivry who became, by mariage the countess Ruffo di Calabria. Ludovico Ruffo di Calabria was the brother of Fulco, an Italian aviation hero of World War I. He will have a number of children amongst which Paola. 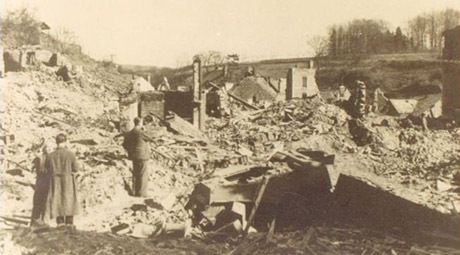 During this bombardment, it's therefore the aunty and cousin of our queen who died under the bombs. They died during the bombardment of 26 December 1944. 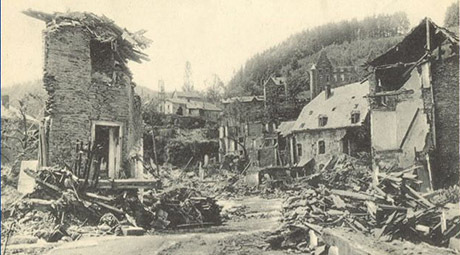 First bombardment that destroyed the château des Agelires, residence of the Orban de Xivry family. The monument was officially inaugurated on 15 September 1964, during the memorial day. 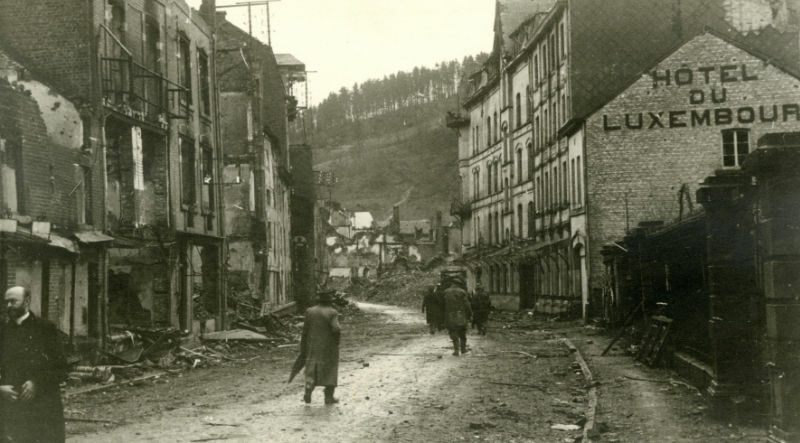 This day had a triple goal: celebrate the 50th anniversary of 1914, the 20th anniversary of the liberation of September 1944, and the completed restoration of the town.